The interior and exterior of a rental home can be damaged and need costly repairs following a large storm. As a property owner, a storm can interrupt your cash flow and have a big impact on your investment business. When you partner with Sacramento rental property management experts like Real Property Management SAC-METRO, we will help you weather any storm. Prioritize Clean Up – Identify current and potential dangers. Look for hanging tree limbs or unstable trees. Get those out of the way first. Call in the Experts – Tree removal is a dangerous job. Trees are extremely heavy and are known to cause serious injury or death when not handled properly. 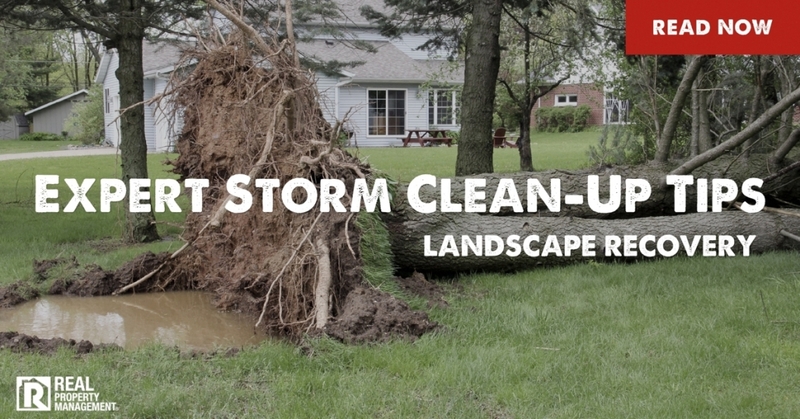 Individuals trained in tree removal know how to safely clean up after a storm. Inspect for Drainage Issues – A large storm can change the natural water drainage of a yard. Because storms wash away soil and shrubbery, the drainage system can be altered. When cleaning up after a storm, make sure to lead water away from your home. Watch Out for Standing Water – Water accumulated after a storm can be a health hazard. Standing water hoards dangerous substances such as sewage and industrial waste. It is not recommended to enter such water without proper clothing, gloves, and protection. Do not risk the chance of infection and health consequences by not taking the appropriate precautions. Create a Plan – Small shrubs and perennials can wait. Make a priority list of what is required to get the yard back to an acceptable condition. Access the overall damage to smaller plants. See what can be salvaged and then determine a game plan from there. Do not delay cleaning up after a storm. We are ready to help you restore your rental property landscape. Real Property Management SAC-METRO works hard to safeguard your property and protect you as a homeowner. There is no need to let the stress of a being a landlord overwhelm you. Find out more about our hassle-free leasing cycle and how we can make you a profitable in Sacramento rental property management. Give Real Property Management SAC-METRO a call today.